Whether you’re steelhead fishing for the first time or an experienced angler, Oregon offers an exciting steelhead fishing season and a limited but robust run. We use many different techniques this time of year, the water levels and color are constantly changing. From Side Drifting and Bobber Dogging to pulling plugs we will make sure to find what the fish are biting. This time of year we do pay a lot of attention to the rain and water levels I will not take you fishing if I think there is not a very good chance/probability of catching fish. Typically we won’t fish the rivers if they are on the rise. 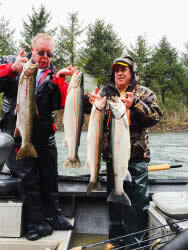 The Wilson River is one of the top winter steelhead rivers in Oregon. 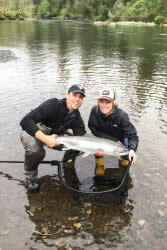 With native and hatchery steelhead runs the Wilson River gives us a great chance of taking fish home for dinner along with the chance to fight a larger native steelhead. These native generally put up a great fight and maybe you can take home a prize photograph if you can’t keep the fish. Expect a full day of fishing – unless we fill our tags early. Our Boat has a heater for the cold days or just to keep your coffee hot or warm up your lunch. All necessary equipment will be provided. We use G Loom is Rods, Shimano Reels and Shortbus Flashers. Just make sure you bring a few important items with you. Call (503) 858-2699 or Contact Us today.